Over 240 Syrian refugee families have been living in a town’s former prison in Kurdistan. This prison also used to house Saddam Hussein. 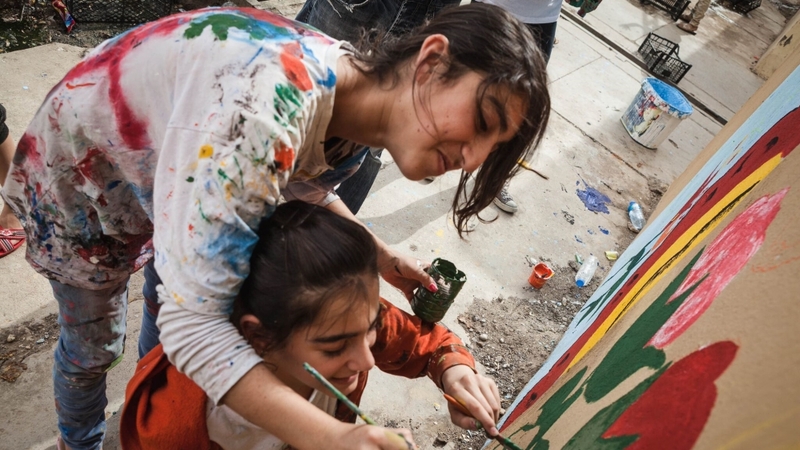 Every week, children who live in the prison gather and paint murals onto the walls. The bright murals not only improve the bleak atmosphere of the prison walls, but serve as a creative outlet for refugee children in the camp.The children are encouraged to bring their own drawings to serve as inspiration for the mural they paint. Focusing on positive imagery rather than bad experiences allows for focus on the future. The children were asked to paint pictures of their hopes and dreams. Castle Art, an NGO, supported the children’s creation of artwork in a healing way. This entry was posted in Other Issues on August 12, 2015 by palmyrarelief.